That I decided to build a swimming pool this year. Very glad. The Wall Street Journal Online has an interesting story about the oil rig explosion. Which, as usual, didn’t have to happen. It’s a familiar recipe for disaster: possibly shoddy work, Bush-era ‘voluntary compliance’ with regulations, regular safety violations . . . and now another familiar ingredient, Halliburton. You know, those fine folks who electrocuted those showering soldiers in Iraq? Good old Halliburton. Halliburton also was the cementer on a well that suffered a big blowout last August in the Timor Sea, off Australia. The rig there caught fire and a well leaked tens of thousands of barrels of oil over 10 weeks before it was shut down. The investigation is continuing; Halliburton declined to comment on it. Here’s a story for the young ‘uns and a flash back for the oldsters. First, I took the dozens of film cartridges to a commercial studio to have them converted into video tape. Then – I started playing the now-edited video, adding more notes to my earlier one from the LP’s, and organizing on paper what song would play over what parts of the video. When I was done, I played the audio tape and video at the same time to make them align as best I could, stopping and overwriting and making corrections (mostly in the timing). Now on to the next step. I packed up my video and audio tapes and drove the 40 miles back to the studio, where they combined the sound track with the video track, producing a single integrated tape. I then requested five copies which I wrapped individually and gave to family members as Christmas presents. It was a big hit. 25 Years later a niece put it onto CDs for us. Today, I can do the same thing with my phone and email it to a hundred people, five minutes after shooting it. Remake of a pop video from Telephone (group name? song title? Not a clue.) – here is the 21st Century version of the WWII iconic troops-singing-and-dancing number Bloody Mary. These guys warm my heart – stay till the chorus comes in! 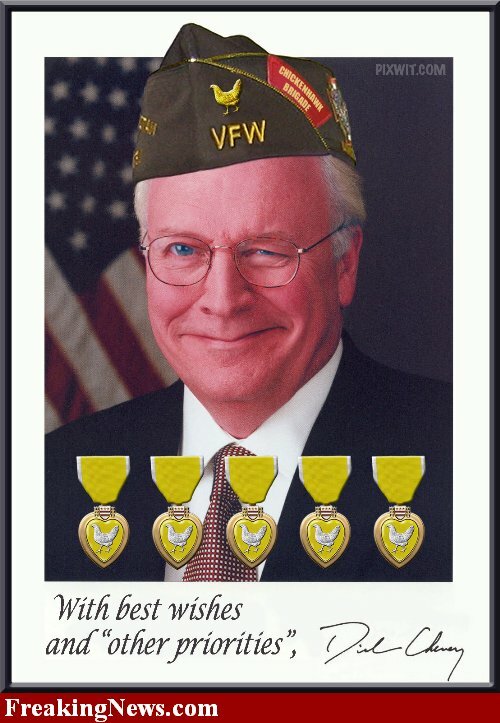 And be sure to give them kudos for being so upbeat on this 204th day of the ninth year of the War in Afghanistan. LOS ANGELES — Insurance giant Anthem Blue Cross, the company criticized by President Barack Obama when it proposed raising rates for Californians by as much as 39 percent, withdrew plans for the proposed hike Thursday. Los Angeles-based Anthem made the decision after an independent audit determined the company’s justification for raising premiums was based on flawed data, state Insurance Commissioner Steve Poizner said. The decision also came one day after Anthem’s parent, Wellpoint, Inc. of Indianapolis, announced its first-quarter profit soared by 51 percent. As we’re all treated to yet another public flogging of miscreants – reminiscent of the circuses surrounding Enron, WorldCom, Lehman Bros, ad nauseum – it’s important to bear in mind the important distinction between punishing people who broke existing laws and the need to reinstate a modicum of sanity into the system forms the underpinning of our entire economy (and a good chunk of the rest of the world’s as well). Nobody built this country – or has ever died for it – so that Ivy-trained assholes could feast on its lifeblood. We may have gotten fat, dumb & happy as a result of our success, but if we don’t want to on the ashcan of history faster than any empire that’s come before us we’re going to need to mind the store. Outlawing behavior such as this would be a great step in the right direction. Oil and water. And fire. I noted in a post on Earth Day that forty years ago, before today’s environmental laws were enacted, we actually had a few lakes on fire in this country – something that hasn’t happened since. In an unusual twist on that, the Coast Guard is about to set controlled fires in the Gulf of Mexico to try to burn up the oil spill which is now threatening very sensitive lands and fisheries in Louisiana. At this point, the slick is within 20 miles of land. I’ve never heard of this before. It’s fascinating. Listening to a discussion on PBS right now and it’s a very very delicate matter and the entire program, of which the burn is only a part, could take many many months. UPDATE: Just heard the slick is now three miles from land. Everyone – from the Coast Guard to the Army to BP and the other oil companies is getting involved to try to contain this – it’s far worse than originally reported, up to 5000 barrels a day now – not gallons, barrels! The wind direction is still keeping it from being a threat to Florida, but that could change. 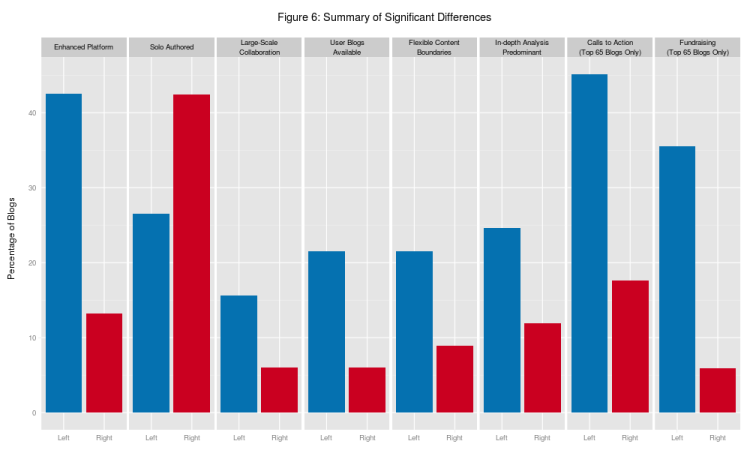 The graphic is a bit fuzzy – a bit clearer at the link. Dum-da-dum-dum. The countdown . . .
Cage is a comin’, cage is a comin’. 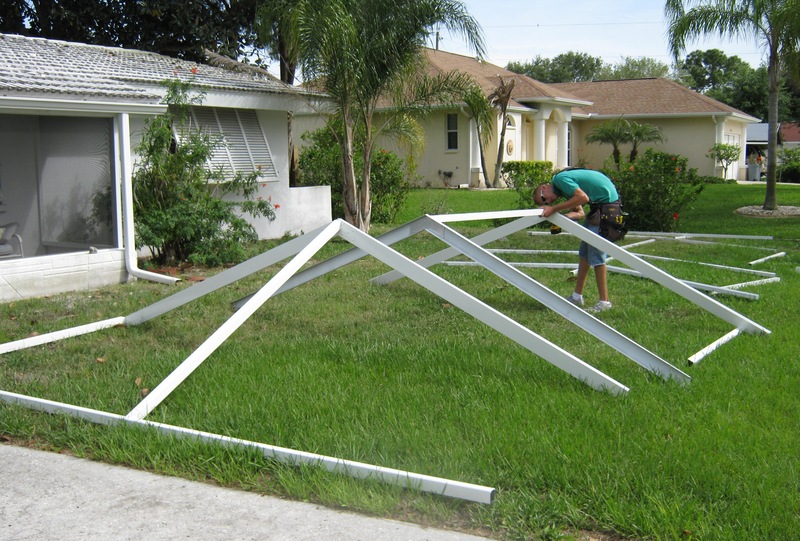 They’re building the new and larger cage in the front yard, and taking down the old rear screen wall in the back yard. Ten days or less? It’s 11:25pm and I just took a last look at memeorandum to see what’s up in the world. Especially to see what’s up in my country. Tylenol PM for me tonight. WASHINGTON — Goldman Sachs reaped “billions and billions of dollars” in profits by secretly betting in 2006 and 2007 that the U.S. housing market would crash, a strategy that conflicted with the interests of its clients who were still buying the firm’s risky mortgage securities, Senate investigators said Monday. UPDATE: Once again, we seem to deserve our fate – Goldman stock went up today. Conservapedia.com (run by the spawn of Phyllis Schafley) is an amusement that gets about one one-thousandth the hits that Wikipedia gets. As stunningly stupid as that concept was, it has now been surpassed. Meet popmodal.com. They bill themselves as the “Conservative Alternative to YouTube”. Honest. I’m speechless. (I got there following links from a blog post by my conservative friend Steve. It set me off to find out who was this Dr. James David Manning who is staging a ‘trial’ to prove Obama wasn’t born in the US and is also a CIA agent ad a Marxist. Which should be amusing to say the least. Joan Walsh at Salon is a smart columnist. Smart, versed in the events of the day, knows her history and – a good writer! My eleven readers know one of my constant themes is media failures – how they trivialize, how they ignore important issues, how they constantly miss the point – in other words, what a really bad job they do. 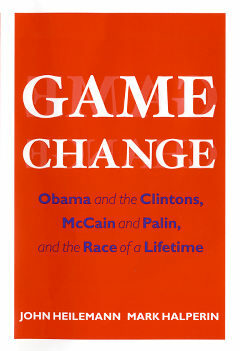 Walsh touches on that subject often and I try to keep up with relevant posts, but I missed this January post about the (now best selling) book Game Change (co-authored by one of the most smug and careless stars of the Washington Press corps). I can’t recall a single political book that received as much media attention. The book is apparently a titillating read (Kitty Kelly does a more professional job) so that was enough to put the authors on teevee non stop for 45 days. Maybe a Mexican flag patch would work better? So what to do in the meantime [until it’s overturned]? Here’s a modest proposal. Everyone remembers the wartime Danish king who drove through Copenhagen wearing a Star of David in support of his Jewish subjects. It’s an apocryphal story, actually, but an inspiring one. Let the good people of Arizona — and anyone passing through — walk the streets of Tucson and Phoenix wearing buttons that say: I Could Be Illegal. Which would then require – by the language of the new law – that police stop that person and ask for papers. If that person can’t produce papers (leave that license them home guys), they’d be subject to arrest. Wouldn’t that be a lovely mess. While media failures (as in ‘reporting this story’) no longer surprise me, sheer stupidity brings us reporting like: “this law ‘makes it illegal to be an illegal immigrant”. What part of already illegal don’t they understand? It is one a.m. And it is one hour into the first day of the ninth year of the War in Afghanistan. My Afghanistan posts from now on will be intermittent (at least weekly is my intention), not because I too am turning away, but because it’s become a stale way to draw attention to the fact. If I can figure out how, I may put a counting device over to the right. Or he can wash my windows. Or vacuum my car. Perhaps I could set him to cleaning out the refrigerator. Humble tasks all. Punishing tasks. Sen. Ben Nelson (D-NE) annoyed every living liberal during the health care negotiations a few weeks back with his astonishing carve out allowing federal largess for Medicaid in Nebraska. Which he eventually abandoned in the face of the universal disgust. Now he’s doing it again. This time, he backed off his support for the Financial Reform act and took it down in yesterday’s vote. He had been aboard right up until that morning. Seems Ben had a provision in the bill to exempt Nebraska companies – read Warren Buffet, a man I admire – from the new requirements for derivatives. Nelson managed to carve Warren right out of that pesky requirement in the bill as it existed before Monday. But in final committee negotiations, that exemption was removed. So Ben took his ball and went home. Our Senate is full of grownups. May I add that even given all that, he’s a hell of a lot more charismatic than Harry Reid. It’s a marvel we get anything done. 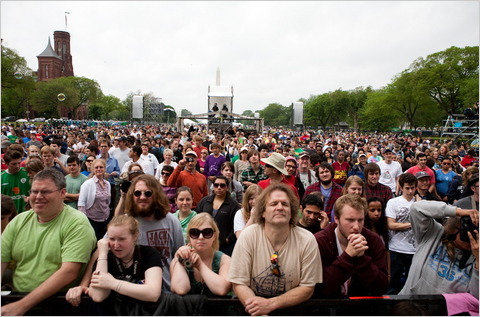 150,000 Americans marching on the Mall for Earth Day this year is chopped liver, because tens of thousands of tea partiers were there recently. Apparently. 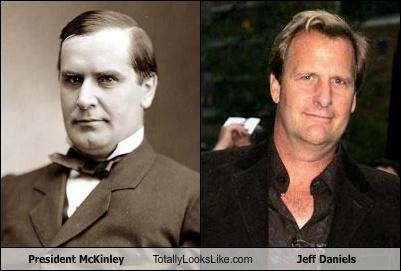 President McKinley totally looks like Jeff Daniels. Totally. And it’s worth a regular visit. Learned about this charming blog it in a comment thread over at I Tried Being Tasteful. Two weeks ago, the NY Times carried an op-ed by Linda Greenhouse on retiring Justice John Paul Stevens. In it she quotes Stevens from a 2005 forum at Fordham Law. Stevens said “Learning on the job is essential to the process of judging.” To his detractors that’s probably proof positive of constitutional crimes or something. To the rest of us, who live in a real world, those words are evidence of a wise and adult human. She notes “John Paul Stevens never lost his willingness to test his instincts against his observations.” More common sense from Stevens. To the right however, who seem to think Justices can and should freeze their legal thinking in 1787 ignoring the intervening centuries, that’s more to say ‘No!’ about. There is no such thing as constitutional originalism. The Founders would have had a good belly laugh at the idea that the broad language of the Constitution they constructed was being viewed in such a rigid fashion. They were an educated lot – like Stevens. And, like Stevens, they allowed for reality. You only thought you heard the fat lady sing. Not this morning. At memeorandum this morning, an Atlantic Online article from Simon Johnson, one of the prescient economists to whom no one listened until their own certainty in their rightness marched a nation – and a world – to the precipice. He says it’s not looking good for us because political will is failing; and we haven’t even locked the barn door yet. The crash has laid bare many unpleasant truths about the United States. One of the most alarming, says a former chief economist of the International Monetary Fund, is that the finance industry has effectively captured our government . . . recovery will fail unless we break the financial oligarchy that is blocking essential reform. Probably not the most pressing concern of our troops in Afghanistan, where it is the 200th day of the War there. “Trust is the prime constituent of the social atmosphere. It is as urgent not to damage that atmosphere by contributing to the erosion of trust as it is to prevent and attempt to reverse damage to our natural atmosphere. Both forms of damage are cumulative; both are hard to reverse. To be sure, a measure of distrust is indispensable in most human interaction. Pure trust is no more conducive to survival in the social environment than is pure oxygen in Earth’s atmosphere. But too high a level of distrust stifles cooperation as much as the lack of oxygen threatens life,” – Sissela Bok, Common Values, 1995. This brings up a serious question for me re talk radio. Their stock in trade is not advocacy but scorn and they use very destructive language when targeting a person, a political party, a cultural institution or a government. All about naming people in particular as the enemy of the talker’s audience. The talk radio world is conservative, but much more significant is their anti-Democrat, anti-liberal narrative, and because it is so focused, it’s bearing negative fruit. To pretend they don’t play an enormous role in the current state of political dialogue is nonsense. Ah. I am not alone. Just before pulling the curtain (for decency’s sake) over the corpse of his show on CNN this morning, Kurtz turned to the media-story-of-the-week, the Jon Stewart/Bernie Goldberg snap-back-athon. Kurtz – as only he can – managed to edit out Stewart’s most memorable line, the one which took aim directly a Howie’s beloved industry. Guess which part of that Kurtz edited out? It’s still morning here . . .
And there’s just a whiff of summer in the air. In Florida, a little sweat from gently wielding a broom is another signal. 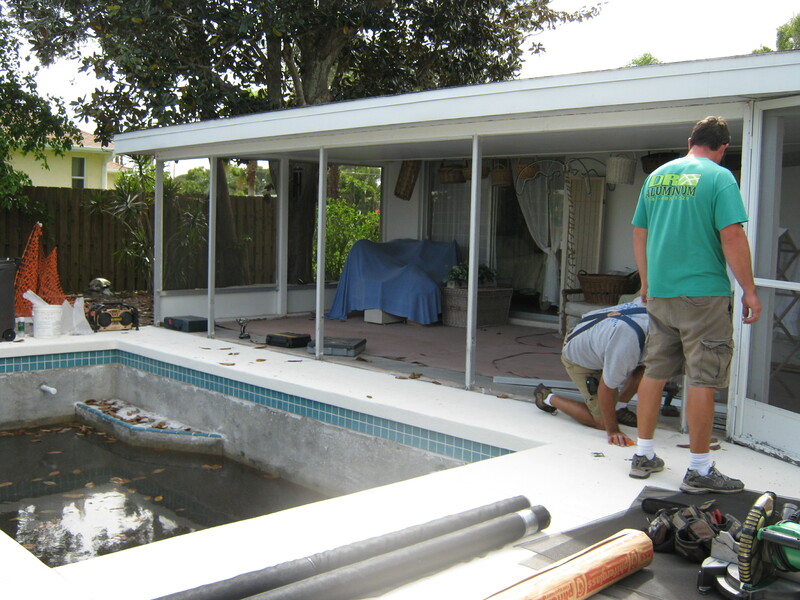 Now, my interest in completion of the pool project sharpens. Meanwhile, part of the lanai is without screens which means sliders on the back of the house must remain closed as the rain of the last 60 days left lots of standing water in culverts (and unfinished pools) so there are more mosquitoes than usual. And some wasps have taken up residence as well. All that is of minor import when the Sunday gasbags are doing their weekly damage and attention must be paid. The biggest offender this week is CNN who own the shame that is “Reliable Sources“, a one hour show hosted by CNN’s media critic Howie Kurtz. Who also happens to be The Washington Post’s media critic. On neither platform does he ever find fault with either paymaster. Works out real well for the media giants and Howie gets to feel important. Today, having noticed the move toward fact checking Sunday shows after the fact, Howie decided to give it a try. He calls it ‘truth squading’ (the man is a wordsmith). Do not, I repeat, do not try to find this segment online and if you do – do not, I repeat, do not watch it. This stuff is dangerous to your health. Not quite as dangerous though as being in Afghanistan, where it is the 199th day of the ninth year of the War there. The one. The only. Those hillbillies knew how to make music. In just 16 months they’ve added more than $2 trillion to the national debt . . . Had President Obama campaigned on this agenda, he wouldn’t have garnered 30% of the popular vote. Our greatest mind, Mr. 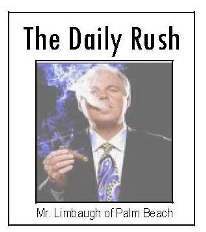 Rush Limbaugh, has a word or two to say in The Wall Street Journal today. The headline alone – “Liberals and the violence card” is accusatory – which of course is Limbaugh’s permanent tone. Be outraged, accuse someone (else) of being the cause, define them as ‘the enemy’, ‘the other’. It’s an old old song. Not quite daily . . . In his op-ed, he honors today’s Tea Party and says one of the reasons for their protests is what Obama has done to the debt. Rush has perhaps not noticed what happened between October ’08 and January ’09? Obama was inaugurated as President of a very different country than he campaigned in. On October 14, 2008, Bush and Paulson announced the economy was on the verge of collapse and created the Troubled Asset relief Program for $700 billion. The economy didn’t collapse. It did however crash. And the ongoing impact on our national debt spilled immediately into the Obama administration. Whether the actions of either administration were right or wrong for the country is something we don’t know yet. It seems we need to remind Mr. Bouncy Bouncy of that little matter. We became a different country 21 days before Obama won the election. Which is, I guess, why the American people elected Obama and the Democrats. 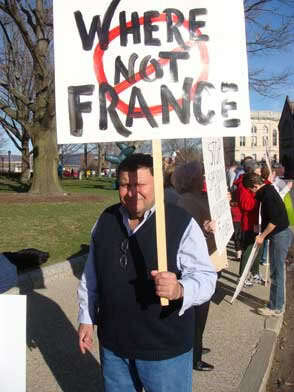 Silly Americans.